The luck of the wee county has continued with a second winning Lotto ticket being sold in Louth in the space of a week. 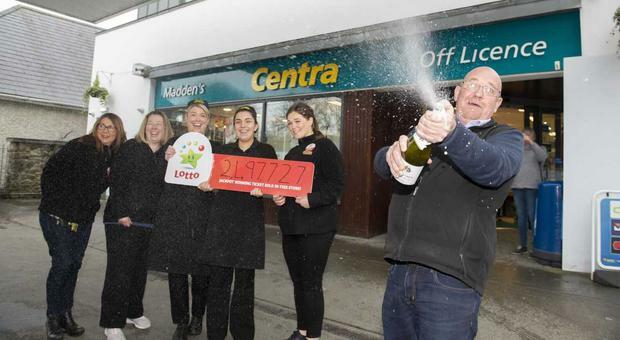 This time a Centra store in Termonfeckin sold the winning ticket for last night’s Lotto jackpot of €2,497,727. The winning numbers are: 1, 3, 7, 27, 31, 44 and bonus number 19. “I was delighted and thrilled to get the call,” said Ray Madden owner of the store. There are 38 people working there and staff and customers alike were full of smiles this (Sunday) morning. “Fair play to whoever won it, I hope it brings them all the luck in the World,” said Catherine Dawson from Termonfeckin. She said there are local syndicates but at the moment they do not know the time it was sold at or if it was a quick pick. Another Centra store, located in Dromiskin, a few miles from Termonfeckin in Co. Louth, sold Friday night’s €500,000 EuroMillions Plus top prize ticket. He said almost 30 cent in every Euro spent on National Lottery games goes back to the community in Good Causes in the areas of sport, health, arts, heritage, culture, youth, community and the Irish language. Last year alone more than €227 million was raised, the equivalent of more than €620,000 a day.